If you’re involved in any kind of inventory or order fulfillment operation these days, you’re probably feeling the effects of an unwritten rule: technology always advances, but so do the demands for better business performance. A good case in point is barcode technology. Barcodes and scanners help us automate data collection and track products, but they don’t stop the drive for ever-greater efficiency and profitability in everything we do. That’s why we continue to see advances and innovations in barcoding, such as the emergence of long-range barcode scanners, which many companies are now deploying as a more efficient alternative to traditional, short-range scanners. Today’s 1D and 2D barcode scanners, such as the 3600 Ultra-Rugged Series scanners from Zebra Technologies, offer scanning ranges of up to 70 feet while still delivering accurate and reliable scanning from as close as two inches. It’s a powerful combination that provides five core benefits that are driving the rapid adoption of this technology in applications ranging from busy warehouses to the local grocery store. Here’s a quick overview of the five reasons to consider making the same switch in your operations. Long-range barcode scanners can discern barcodes from up to 70 feet away, even when labels are located high on shelves and under numerous layers of shrink-wrap. This means a forklift driver or a worker walking through a warehouse or store aisle doesn’t need to get on a ladder or pull down products to scan and track them. This cuts down on the time and effort required for scanning, allowing you to dramatically speed up inventory and fulfillment while lowering labor costs. Even in dimly lit working environments, long-range barcode scanners perform reliably. Their accuracy and precision aren’t reduced, and they can also scan sequentially. This means an operator can press and hold the scanning trigger down to identify multiple items or barcodes. This is ideal for items with multiple barcodes printed on a box, or when scanning multiple barcodes as part of an inventory or fulfillment workflow. Short-range laser barcode scanners have limited range, and the laser needs to be lined up at the right angle to a barcode in order to scan it. Long-range barcode scanners are typically barcode imagers and not laser scanners, so they can scan a barcode at virtually any angle. By combining this omnidirectional flexibility with long-range capability, workers don’t have to pace up and down aisles or get close to barcodes to scan them. The whole process is streamlined and simplified with less repetitive motion. As barcode scanning range has increased, so has the ruggedness and durability of scanners. By switching to next-generation long-range scanners, you also get the benefit of extreme resilience. Devices such as Zebra’s 3600 Ultra-Rugged Series scanners are virtually indestructible and can withstand repeated drops to concrete, exposure to dust and dirt, immersion in water, and use in extreme temperatures. In developing longer-range scanners and omnidirectional imaging, Zebra has also created advanced barcode reading capabilities that make it possible to read labels in almost any condition. For example, its 3600 Ultra-Rugged Series scanners can scan labels that are dirty, scratched, smudged, poorly printed, and obscured by shrink-wrap. The same precision and decoding intelligence also means you can rely on long-range devices to capture barcodes the first time, every time. 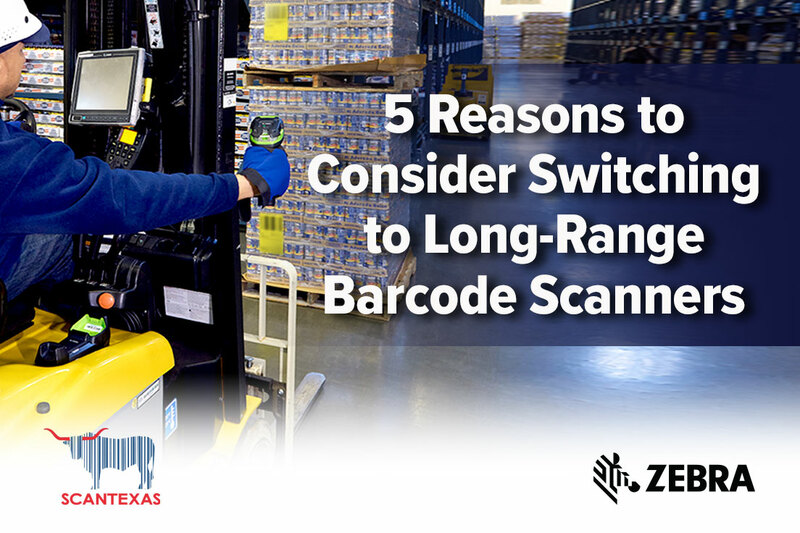 To learn more about long-range barcode scanners and find out what devices might be right for your needs, contact our team at ScanTexas for a free expert consultation.